Japan’s plans to restart the Sendai nuclear reactor won’t be affected by the volcanic eruption of Mt. Ontake, the government said. The reactor is in a separate volcanically-active area, which rose concerns for its safety after the Saturday eruption. The eruption that is presumed to have killed over 30 people and left dozens injured is not a reason for a safety reassessment for the Sendai plant, Chief Cabinet Secretary Yoshihide Suga told a news conference. "This was a steam-driven [eruption] and it has been said it was extremely difficult to predict," Reuters cites him as saying. 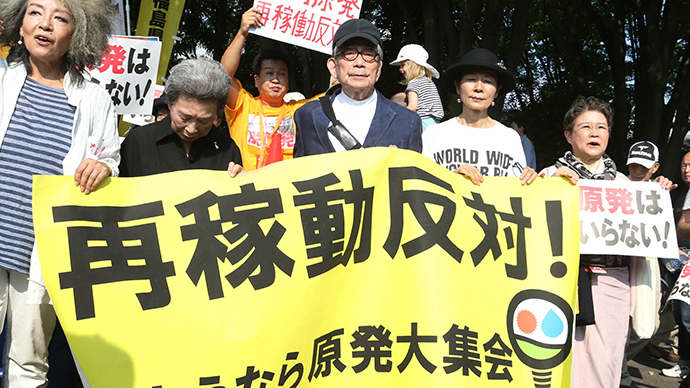 Opponents of the nuclear restart, who gathered Sunday for a protest rally in Kagoshima on the island of Kyushu in Japan’s southwest, where the power plant is located, say that is exactly why they don’t want it to be operational again. "No one knows when natural disasters, including earthquakes and tsunamis will strike. The fact that they could not predict the Mount Ontake eruption highlights that," said Yoshitaka Mukohara, one of the organizers of the demonstration. "There were plumes above Sakurajima yesterday and today. We have no idea when something might happen," he said in a reference to Mt. Sakurajima, a volcano located some 50km from the facility. The volcano experiences hundreds of minor eruptions annually. 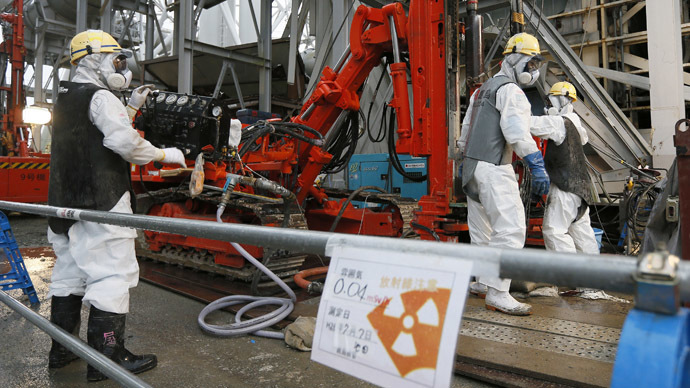 Japan shut down all its nuclear reactors in the wake of the Fukushima disaster. The Sendai facility was cleared on September 10 by the Nuclear Regulation Authority (NRA) to be restarted. The watchdog said the danger of major volcanic activity in the area during the reactor’s lifespan was negligible. The plans to bring back online the nuclear power plants cause protests among many Japanese, who remain fearful of nuclear technology. The government insists that the risks are small and that the reactors are necessary to provide cheaper energy to the economically-challenged Asian nation, which used to rely on nuclear power for a great part of its electricity generation before the Fukushima disaster. Meanwhile, rescue operation involving some 550 people resumed on Monday after a break prompted mid-Sunday by a strengthened smell of sulfur at the mountain indicating poisoning risk. Four deaths have been confirmed on Sunday and 27 people declared in “cardiac arrest” – a term indicating that doctors could not officially certify death yet. 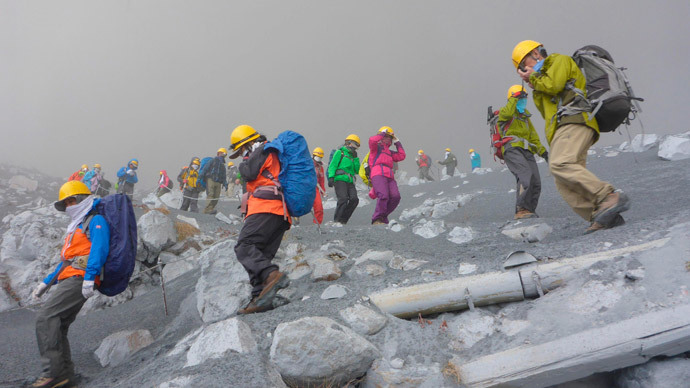 Some 40 people received injuries from the sudden eruption that pondered the area around Ontake with ash and stones, and sent dense smoke clouds down the slope. About 150 people fled the area as it was being covered by a blanket of ash up to 20cm deep. The 3,067-meter volcano is the second-highest in Japan and a popular hiking spot, especially in autumn during the turning of the leaves. Its sudden eruption on Saturday took many hikers by surprise and became the first fatal volcano event in the country since 1991. 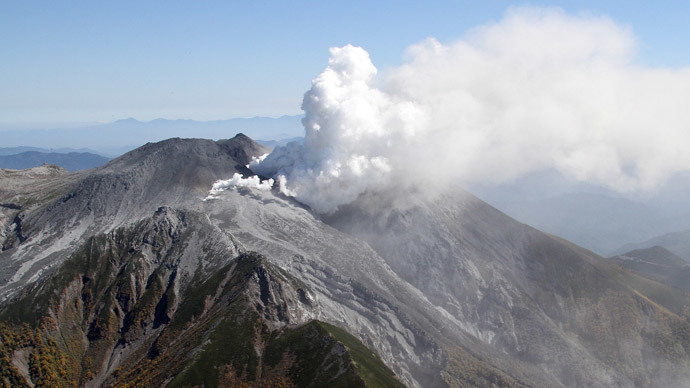 Ontake’s last major eruption was recorded in 1979.